Welcome to Pull It Together, where the goal is to narrow the massive field of comic book titles to the ones you shouldn’t overlook. It isn’t about what’s on my pull list, it’s about what could be on yours! We’re doing this a little early this month, since next week’s New Comic Book Wednesday is the 17th, and by that time we’ll already be half way through September. Everybody likes a little lead time. November is a release month for a swath of trade paperback collections, including Batwoman Vol. 5, Tomb Raider Vol. 1, and Rat Queens Vol. 2. If you’ve been interested in Greg Rucka’s Veil but not enough for single issues, it will make its hardcover debut in November as well. Wonder Woman #36, the first issue from the title’s new creative team, comes out in November, so if you’d like to see where the series goes after the departure of Cliff Chiang and Brian Azzarello, you’ll want to get it on your list. The creatures are really cute and creatively designed: stags with dripping wax candle antlers, acorn chipmunks, and cats made of archipelagos. If that sounds up your alley, ask your comic shop to order it for you! Remember that pre-orders from comics shops are the sales numbers of comics, not consumer purchases. But there’s a flip side to Update Your Pull List Week that I haven’t talked about yet: taking things off your pull list. We’re all responsible consumers here, right? I mean, we work hard for our money, and we want to see it go to things that make us happy. As long as you’re adding stuff to your pull list, take a moment to check and see if there’s anything you should take off. It’s hard for nerds to quit a series of any kind, believe me, I know. 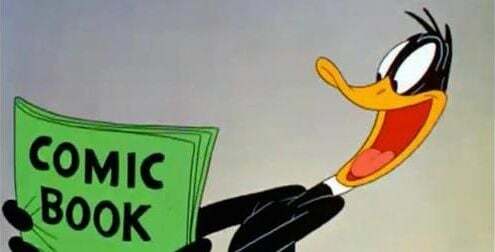 But my usual rule of thumb is: if I don’t get as excited as Daffy Duck up there when I see that a title is coming out this week, then I probably shouldn’t be spending $3-4 an issue on it. Another rule to consider: if you can’t remember what is happening in the current storyline without having to go look up a cover or a preview of the last issue. If that’s the case, you’re probably not as invested in the title as you think you are. Having a tight pull list that’s only full of stuff that excites you is good: it’s good for your wallet, it’s good for your enjoyment and entertainment, and it’s also good for the industry to not be able to coast by on, say, the fannish inclination to follow characters regardless of the entertainment value of their titles. So edit your pull list! And then check out this week’s comics! Each comic in the following gallery is listed with its official teaser summary (in italics) and my own commentary (below that) where applicable. 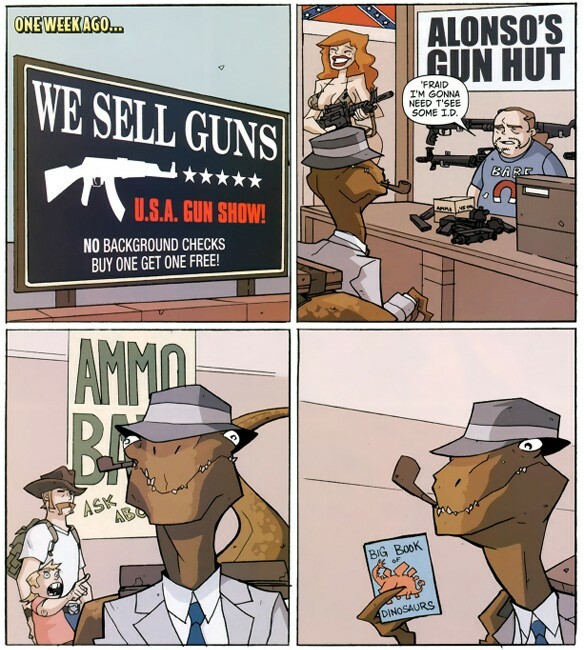 Atomic Robo Sale Every time I have come across an Atomic Robo comic, mostly on Free Comic Book Day, it has been a delight and a joy to read. (I chose this page as the image for this slide, but I almost chose this one instead. ) It's sort of like... what if Hellboy was a robot invented by Nikola Tesla? And what if Hellboy was a supernatural comedy series, instead of a comedic supernatural horror series. If that sounds up your alley, a large swath of the series is on sale at Comixology until Thursday. Barbara Gordon... lady Bane... the rumored first appearance of Cassandra Cain anywhere in the New 52... be still my heart! DC's Future's End event gives us a one shot for every current title that tells a one-issue story about what might happen five years from now in DC continuity. We've got three of them in this week's Pull It Together. Black Widow Vol. 1 44% Off Comixology is having a sale on Captain America-related titles, and that means that the whole first arc of this year's Black Widow series is deeply discounted. What happens when Captain Marvel and her flerkin' cat, Chewie, have an unexpected alien visitor? In space, no one can hear you MEOWWWHISSSS! Witch hunters close in on Coffin Hill—with Bianca and Lacey in their sights. As the girls fight for their lives, Eve continues her search for the cold-blooded killer hiding behind the shield of the Boston police... and begins to suspect the Ice Fisher may be closer than she thought. Greg Rucka Sale Comixology's current Greg Rucka sale features the entirety of Stumptown, the noir-ish but modern adventures of private detective Dex Parios, a great buy if you're looking to brush up on the series before it starts its third storyline this week. And it also includes the first three volumes of Queen and Country, an amazingly compelling realist look at the work of British spies, starring top operative Tara Chase; which will hopefully become an amazingly compelling realist look at the work of British spies, starring Ellen Page. KATE-GUY! MADAME MASQUE! LOS ANGELES! EXPLOSIONS! THE END OF SUMMER VACATION! THE FINAL SHOWDOWN FOR ALL THE MARBLES! THE MARBLES ARE A METAPHOR! YOU BELONG YOU BELONG YOU BELONG YOU BELONG TO THE MERRY MARBLE MARCHING SOCIETY! This is... THE BIG ONE. With covers from Pretty Deadly's Emma Rios, Hexed follows supernatural heroine Luci Jennifer Inagcio Das Neves, or Lucifer for short. And if you didn't catch the first issue, it'll hit stands as a reprint soon! For the first time in the 65 years since they divided the world, the 16 Families are gathering again. For Malcolm Carlyle, it is an opportunity to identify and eliminate his enemies. For Jakob Hock, it is an opportunity to exact for revenge. And for Forever Carlyle, it's the first step in discovering the truth about who she is, and what she is destined to become. Kamala crosses paths with Inhumanity for the first time -- by meeting the royal pup, Lockjaw! Every girl wants a puppy, but this one may be too much of a handful, even for a super hero with embiggening powers. He may be the Queen's pooch, but this dog's one royal pain in the neck. Granny visits an apple convention and is dismayed to see the Flim Flam brothers are up to their old tricks. Only the two are no longer working together! Greg Rucka's fan favorite private eye is back in a new ongoing series illustrated by Justin Greenwood! Things never go according to plan for Dex Parios—it doesn't matter whether it's work or play. When a weekend of soccer fun (both playing and watching!) turns ugly, it's up to Dex to get to the bottom of the violence before a heated rivalry transforms into an all out war! Dexedrine Callisto Parios is the woman at the heart of Stumptown, private detective, Portland native, kickass lady, and working single parent to her mentally disabled younger brother. If you like thorny, twisty detective stories, you'll want to check out Stumptown, and thanks to that Comixology sale you can even catch up for cheap before you start the new storyline (though this new one will likely be pretty self-contained). While Velvet's been on the run, ARC-7's top men have been hunting her...now they have her trail, and soon she'll be in Colt's sights. Jump into the comics of Joss Whedon with a value-packed issue that contains three number ones of the newest Whedon series: Buffy the Vampire Slayer Season 10 #1, Angel & Faith Season 10 #1, and Serenity: Leaves on the Wind #1. And all for a mere $1. Are you looking forward to picking up a title this week that isn’t in Pull It Together? Mention it in the comments and I’ll take a look! Just remember: PIT only covers one week at a time, not one month! If it’s not coming out this week, it won’t be on the list.